Sunday, 24th September saw Stuart Montgomery celebrate 25 years of music ministry at St Michael’s. Rev. Dr Margaret Forrester led the morning’s worship. A wonderful occasion of thanksgiving and celebration. 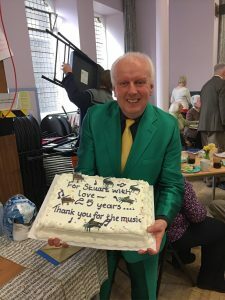 The Kirk Session and members of St Michael’s wish Stuart every best wishes and blessing at this celebration and wish him many more years of toe tapping, thoughtful music making years together. Information of the forthcoming music for Sunday mornings can be found here.